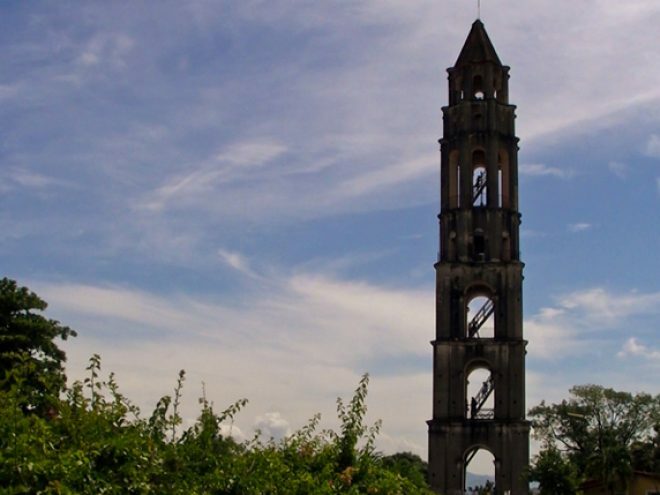 Twelve kilometers northwest of Trinidad, the Manaca-Iznaga Tower continues to watch over the Valle de los Ingenios (Valley of the Sugar Mills) as it did over 180 years, although its purpose today has nothing to do with its origin. The story of the construction of the tower is still much debated. According to one legend, the Iznaga brothers made a bet to see who would attain the more fame. Alejo built the 45-meter tower and Pedro constructed a well 28 meters deep. Another legend has it that Alejo had ordered its construction to lock his adulterous wife in. A much more rational interpretation, however, gives the tower a utilitarian purpose, serving as a watchtower against fires, storms, runaway slaves and keeping the black slaves who worked in the plantations under control. The tower bell that once hung here (decades ago it was blown away by a strong hurricane) served to call to prayer and signaled the beginning and end of the slaves’ working day. The tower is divided into seven levels of different geometrical shapes that go from squares to octagons, has spacious arches and a 184-step internal staircase from the base to the top. It is built with mud bricks and a traditional mortar of lime and sand. From its top, the visitor can take in the entire valley, which was declared a UNESCO Cultural Heritage Site thanks to the preservation of 65 archaeological plots. The tower was declared a national Monument in 1978.